Andrew Jones is an artist in the West Village in New York City. He is a contemporary painter of original oil paintings. His artwork also includes scenes of Greenwich Village and the surrounding neighborhood, including Soho and Chelsea. These New York cityscapes primarily depict brownstone stoops and brick facades of historic Federal and Greek revival townhouses. His “stoopscapes” focus on cast iron and wrought iron railings, often bathed in raking sunlight. 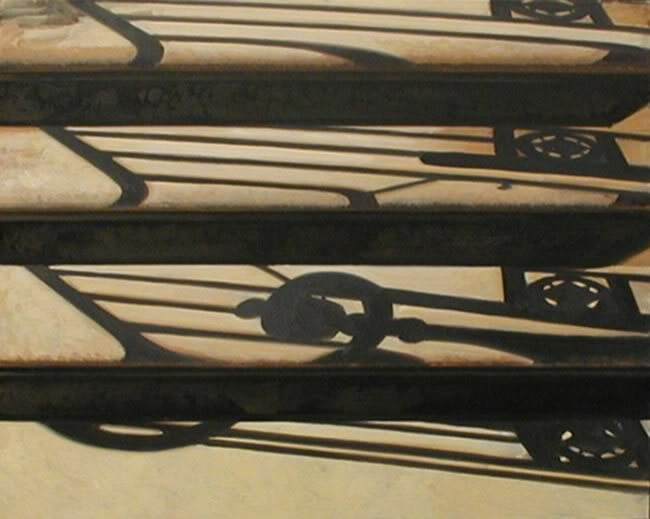 Others paintings portray the shadows of ironwork as they cascade down brownstone steps. Jones’s art often merges a tradition of realism with the beauty of abstract form, resulting in artwork that is both Classical and modern. In 2011, Jones had a solo show of 25 paintings at the George Billis Gallery in New York. Jones's previous solo show took place at the Museum of the City of New York from March to June 2009. A catalog for the show is available through the Website contact. In recent years Jones has also exhibited in juried group shows at the Butler Institute, Agora Gallery, Prince Street Gallery, Bowery Gallery, Viridian Gallery, the Salmagundi Club, and The National Arts Clubs. Jurors have included renowned artists, such as Philip Pearlstein and William Bailey, as well as curators from museums including, MOMA, the Guggenheim, the Whitney, the Metropolitan, the Brooklyn Museum of Art, and the Chelsea Art Museum. American Art Collector and American Arts Quarterly have reviewed Jones's shows.